Obama: “The best is yet to come.” Really? When President Obama tried to get a real Middle East peace process going by calling on Israel to halt its illegal settlement activity and his “Yes, we can” became “No, we can’t”, I dared to invest some hope in the idea that in a second term he would use the leverage all presidents have to oblige Israel to end its defiance of international law and be serious about peace on terms the Palestinians could accept. And that investment was not the consequence of mere wishful thinking on my part. There were two main reasons for my cautious optimism. The first was (and is today even more so) in the fact that behind closed doors in Washington D.C. top military and security people are completely aware that it’s no longer in America’s own best interests to go on supporting the Zionist (not Jewish) state right or wrong. The second was my knowledge from sources I trust that Obama has always understood that without an acceptable measure of justice for the Palestinians there could be no end to the conflict, only catastrophe for all. When he was preparing for his first run for the White House, he told a close American-Palestinian friend not to expect too much from him in his first term but to be optimistic about what he could and would do in a second term. (I took that to mean that Obama was fully aware of a fundamental truth expressed to me by former President Carter. As I have stated in previous articles, he said that any American president has only two windows of opportunity to take on the Zionist lobby, the second window being the last year of his second term – i.e. after the mid-term elections of the second term). Today there is a third reason for cautious optimism. It was summed up in a Ha-aretz headline over an article by Akiva Eldar on 12 November – American Jews are giving up on Israel. The most worrying news that came out of the U.S. presidential elections was that American Jews seem to have lost interest in Israel. Just 10 percent of American-Jewish voters said Israel was their highest priority when they went to the polls, according to a recent exit poll conducted by the pro-peace Israel lobby J Street. Nine out of 10 said domestic issues like job rates and health care were their top concerns. This is despite the fact that the Republicans and Jewish activists, many of whom are supporters of Prime Minister Benjamin Netanyahu, told countless horror stories about what they described as Barack Obama’s plot to throw Israel to the Iranian wolves. These statistics support the analysis of political commentator Peter Beinart, an associate professor at the City University of New York’s Graduate School of Journalism, who argues that the ongoing occupation and the revelations of Israeli racism have distanced American Jews from Israel and from the Zionist idea. And then there’s this. For a recent study two researchers from the California State University and the Hebrew Union College asked young American Jews whether they would regard Israel’s destruction as a personal tragedy. Fifty percent said they would not. “One explanation is that many young American Jews feel that Zionism conflicts with their liberal values. Raised on the ideal of universalism and exposed to post-nationalist ideology on campus, they cannot grasp how a nation state of and for a particular people is not racist by definition. What all this suggests to me is that a growing number of American Jews are beginning to understand that it’s only by distancing themselves from the Zionist monster that they can best protect their own interests. As I have previously argued (it bears repeating), what we are witnessing in the world today is a rising global tide of anti-Israelism, which is NOT anti-Semitism. The danger is that it could be transformed into classical anti-Semitism if American and European Jews do not distance themselves from the Zionist state and its crimes. It has never been a secret that the Zionist lobby in all of its manifestations does not speak for most American Jews. In recent years, for example, polls taken by various Jewish institutions and organizations have indicated that AIPAC, the dictator of American policy on all matters to do with the Israel-Palestine conflict, represents the views and wishes of not more than 25 per cent of American Jews. If the process of American Jews distancing themselves from an arrogant, aggressive, oppressive, racist and unbelievably self-righteous Israel really is underway, a second-term President Obama will be more free than any of his predecessors (though perhaps not until his last year in office) to take on, isolate and see off the Zionist lobby. “To begin with, the rising political force in America is not the one with which Bibi has aligned Israel. As the Israeli columnist Ari Shavit noted in the newspaper Ha’aretz last week. ‘In the past, both the Zionist movement and the Jewish state were careful to be identified with the progressive forces in the world. … But in recent decades more and more Israelis took to leaning on the reactionary forces in American society. It was convenient to lean on them. The evangelists didn’t ask difficult questions about the settlements, the Tea Party people didn’t say a word about excluding women and minorities or about Jewish settlers’ attacks and acts of vandalism against Palestinians and peace activists. The Republican Party’s white, religious, conservative wing was not agitated when the Israeli Supreme Court was attacked and the rule of law in Israel was trampled.’ Israel, Shavit added, assumed that ‘under the patronage of a radical, rightist America we can conduct a radical, rightist policy without paying the price.’ No more.” (The last two words were Friedman’s own). One implication is that it’s not only a growing number of American Jews who now regard Israel as a liability. Though still a minority, a growing number of all Americans are beginning to see the same light. And that’s why I am not abandoning hope that at a point, most likely in the last year of his second term, President Obama will feel himself free enough to do what I truly believe he really wants to do – confront the Zionist monster, beginning with its lobby in America. It may also be that events in Greater Israel will assist Obama to abandon the policy of support for it right or wrong. I will explain why in my next post – Israel heading further down the road to fascism? I believe you underestimate the Zionist stranglehold on the corridors of power in DC. Also, we all do know what happened to JFK, but no-one talks about his "elimination". Besides, anyone in position of authority who may be remotely suspected as a potential threat, or even a credible whistle-blower, is likely to have the same fate as JFK. "Take'' Concerning Americas` ''Dimming relationship with Israel. Israel shoots Itself in the foot at least Twice a week. But IT has really DONEIT When it Attacked The Imprisoned Gaza strip Where They have Penned up The Palestinian people .. They are soon going to Have to Pay for All of Their Iniquities..And The Time is Short when This will Occur. The US of A. is Not going TO War for Israel any More..Nowhere . Any "Fight they Instigate Now..Will be Theirs to Deal with. Our Resources ( Militarily, financially, and Human resources >>Will not be Dispersed...Dispensed..Ever again ..To Please That Entity called Israel Ben can put his foot in his Mouth and Keep it there..If he Wants TO help matters for that Piece of Stolen land called Israel. Americans of conscience are increasingly horrified with Israel's turn toward fascism and racism on an ideological level ala Likud. This is marginal politics and not mainstream Americana, not now. Jim Crow is history, and these fear-mongers will be history eventually. It is up to Obama to throw down the challenge to Israelis -- keep it up, provide no justice, hammer Palestinians and demolish homes and you will not be supported by the US, not any longer. Let Israelis make the choice to either provide some justice to Palestinians or leave the fold of civilized states on a permanent basis. It must get to the point that a boycott is demanded by Americans taking to the streets. All I can say is: Good luck with that. Obama is owned and operated by Israel-Firsters in Chicago who financed his entire career. He's not going to suddenly do a 180 on them. Quite the opposite - he's going to double-down on his policies against Syria, Iran and in support of Israel. @ Richard Steven Hack - Ditto on good luck with that. It's not so much that Obama is owned by Chicago Israel-Firsters as the fact that Israel is only doing America's work in the Middle East, and will continue to do it no matter who is president or which party is in office. Obama makes no decisions, he carries out orders. His promises to address Israel in his second term are worth about as much as any of his other promises. As far as Iran is concerned, it is not Israel who will make the decision. If there is war, you can blame it 100% on the US; just as in Afghanistan, Iraq, Libya, Syria, and everywhere else the US is drone bombing. PS -"The US is using Israel for its dirty wars and, in turn, Israelis are using the US to fight their neighbours. They are unswerving allies, each gaining power and expanding their control over foreign territories and their populations, and their allies are benefiting from it. Whatever pretext is being used, the reasons for waging wars remain the same: power and money. And that is always achieved by demonizing whoever is in the way." 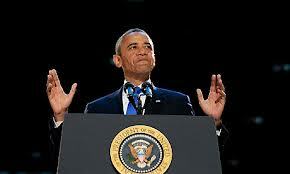 Obama has shown that he is a conciliationist by nature. He will not confront Netanyahu. The Pentagon and military industrial complex determine his actions. I read your blog every week, and find it very valuable and reasonable. Thank you for your careful and exacting analysis. History in West Asia/Middle East is dark - in the past, at the present - and, if no change of mind, also for the future. Israel: Heading, as you end, down the ditch of fascism, i.e. war with Iran, ethnical cleansing of the Palestinians? And, I add, a civil war? With or without Obama, the U.S. is equally divided: collapsing economy, a dysfunctional political class, a military-industrial-congress-complex running amok, growing poverty and apathy, Tea Party populism/fascism, coup d'etat, a nuclear adventure in Iran? Hope? Yes! The seed of peace and justice exists in the Palestinian nonviolent movement. Occupy in the U.S. could grow if it leaves "occupy" behind, and expands and expresses the depair and hopes of the 49% and the middle class. Waging Nonviolence, 14 July 2012). Excellent perspectives, Alan, per usual. However, one thread running behind the subtext of your commentary bothers me. If Obama is sufficiently pressured to wait until the final year of his second term, before being well-enough positioned to act decisively against Israel's defiance of international law, I presume it's because of the obvious possibilities of politically damaging himself and/or his Party. Should this be the case, it begs to be noted that by Obama's final year the next presidential election tilt will be in full swing. Would not precisely the same kind of worries apply then, at least to the Party? Or will the social evolution of anti-Zionist sentiments minus anti-Semitism have progressed to the point Obama is freed to act? On a different tack altogether, I would suggest the widening shake-up of top military command might be signaling a 'general' housecleaning of the Pentagon, conducted by Obama. This in turn may signal he'll act a little more expeditiously toward the Middle East than any of us suspect. Let's hope so. Good morning Alan: wonderfull up lifting post for freedom. the link above might help in this effort. When Obama said: "The best yet to come". What he meant was - "My Christian salvation is in the service of Jews". Obama was confirmed "kosher" when both Netanyahu and Barak blessed his victory by proclaiming: "Obama's re-election is good for Israel". And what was Obama's first act in country's foreign policy - new crippling sanctions against the Islamic Republic. The "military poodle of Zionism", Gen. David Petraeus' disgraceful sacking over his mistress - is a warning which Obama cannot ignore. I would not trust Obama at all, neither hope for anything from him. He is an empty suit, a talking head. His assault on America's working class shows where his interests lay. But that even Americans are starting to see through Zionist criminality is a good sign.